The waiting is over. British Airways has launched its brand new Club World business class seat. And, I have to say, it is far better than expected. The product is called Club Suite. It’s called Club Suite because it has a door. I saw the seat on Friday via an impressive virtual reality simulation. Whilst the downside of VR is that you can’t touch the fabrics or test the firmness of the seat, VR does let you walk around a ‘real’ cabin and get a better feel for the general layout than you’d get from sitting in a real seat on a factory floor. I should say that the images supplied by British Airways, which you will see below, do not give anywhere near as good an impression of the seat as I got from my VR tour. …. which should hopefully give you a better feel. I added a couple of screenshots to the article. Where I can try Club Suite? The seat will launch on the Madrid route in mid August. The exact date is not known because BA only gets 30 day notice from Airbus of final delivery. If you want to book a speculative Avios ticket, it is planned to operate the first Heathrow rotation of the day at 06.20 although this may change. The first official routes will be selected flights to Toronto and Dubai. Whilst the official press release is quoting October, Toronto may start during September depending on the delivery date. What is Club Suite like? Let’s start with the technical stuff first. In this article on 31st January I speculated that it would be the Collins Aerospace ‘Elements’ seat, previously known as ‘Super Diamond’, but with a door. Collins had produced a mock-up of such a seat, although no airline had ordered it, and we knew from a BA Future Lab survey that a door seemed likely. I was correct. The Super Diamond seat is already in operation with Qatar Airways (for non Qsuite aircraft) and various other airlines. If you read my Qatar Airways 787 business class review here then you will have an inkling for what to expect. Let’s run through a few of the key features. This is based on the A350 configuration, which will see a 56-seat Club Suite cabin in a 1-2-1 layout. 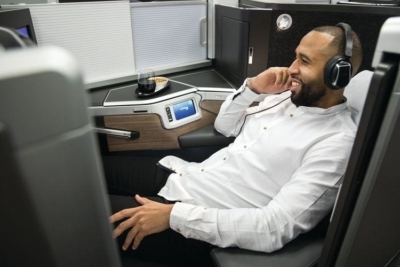 BA has been touting ‘all aisle access’ for some time so this is not a surprise, and to be frank it is the very least you’d expect in 2019. This is the secret of Club Suite and indeed other variants of Super Diamond. The reason that you are able to gain huge amounts of personal space around the seat is because your feet disappear into a triangular cubby hole under the back of the seat in front. I know that not everyone is a fan of this layout, but I like it. I can’t imagine, once you’ve seen the seat, that you wouldn’t prefer it to the old Club World layout. British Airways is advertising Club Suite as a 79 inch long bed when fully reclined. This is seven inches longer than the current Club World seat. In reality the bed is longer but because it tapers into a V-shape they are not measuring it directly to the tip of the ‘V’. As BA has previously promised, the seat has a fixed TV screen. The upside of this is that you can watch it ‘from gate to gate’ with no need to stow it away. The downside is that it is sitting there in front of your face for the entire trip whether you like it or not. As you can turn it off this is unlikely to be an issue. The screen size will vary depending on aircraft type – the A350 seems to be getting 18.5 inches. There is no mention of 4K. There is a 2nd hand-held screen which can be used by anyone who prefers that. There is also a display screen on the IFE controller, which means that you get three screens in total! The seat comes with a double belt. One comes across your shoulders and the other sits across your lap. The shoulder belt only needs to be worn for take off and landing. Apparently this is a trade off – safety rules meant that BA had to either fit a bulky airbag into the lap belt or make you wear a 2nd belt. This option is seen as better because you are not encumbered by an unreasonably bulky belt during the flight. Yes, you now have somewhere to put your glasses! In fact, you have lots of places. You get a little cupboard next to your head which will take a small laptop or iPad (the A350 planes come with wi-fi). There is also a flip up storage unit next to the control unit, which contains all of the charging options you’d expect in 2019. Finally, there is a small storage unit near to floor level which contains a bottle of water. This is apparently well placed for when the chair is in bed mode. This is one of smart touches that you wouldn’t normally expect from BA. The inside of the door to the storage cupboard next to your head is mirrored. This allows you to check your appearance before leaving the plane. If you are travelling with your partner you are likely to take a middle pair of seats if you want to chat. The privacy screen slides left to right, instead of up and down, and is smaller than the existing one. Even if the screen is open it honestly doesn’t invade on your privacy. Because the seats are angled inwards it isn’t perfect for a couple who can’t bear to be apart. Your head is a few feet away from the head of your seat mate – your head is actually nearer to the head of the person across the aisle from you. 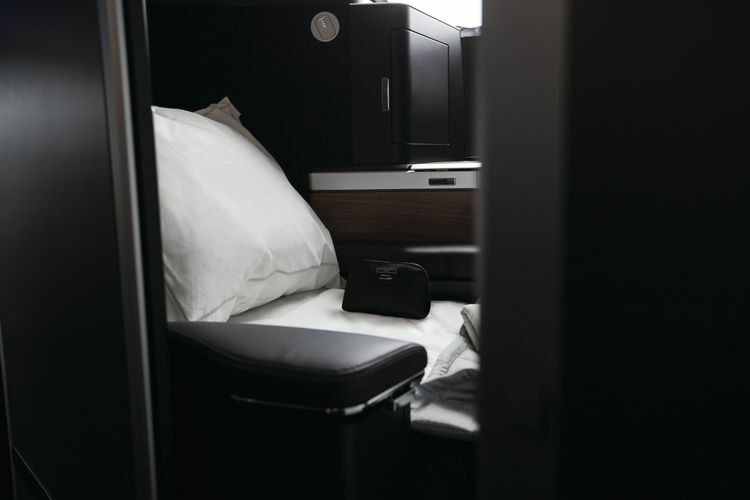 Some airlines have started to remove overhead lockers from the centre of the aircraft for aesthetic reasons, because it gives the cabin a greater sense of space. British Airways has chosen not to do this on the A350. BA is very proud of this. Your tray table slots away under the TV. When you pull it forward, it slides outwards and downwards. This means that it is stored fairly high and maximises leg room. The tray folds in half, so you can use it as either a table or a drinks tray. Importantly, you can push it forwards when in use to allow free access to and from the suite. This makes it easy to nip to the loo or attend to your children during the meal service. Let’s talk about the door though. Let’s talk about it in Part 2 of this article, which you can find by clicking here. I wonder if they will stick 32 Business class seats between Door 1 and Door 2 on a 777 …Are they actually reducing density? That’s interesting. Do you have any idea how many CW seats would fit in the same area of the A350? No. But remember that each CW seat is over six feet long. These are a lot shorter because your feet are under the seat infront. Yes of course. It’s going 2-4-2 to 1-2-1 but at an angle meaning more rows presumably. The general consensus seems very positive which is great. My only concern were less seats with the same demand would lessen the redemption opportunities and possibly prices but if it’s only marginal and much improved seat then all good! Might have missed it.. is width any better than current CW lying flat? Nice. And by the time it’s fleet wide our little one will (hopefully) be able to sit still on his own! The seat belt is a positive for me, didn’t like the bumbag belt on Etihad especially when trying to sleep. Looking forward to trying this out. Wondering how this is going to affect both pricing of cash tickets and reward availability. AA’s J award availability dried up completely after they rolled out the new seat on TATL. Agreed. Amazingly I managed to get 2 reward seats on AA new J trans-Pacific, I didn’t expect that. 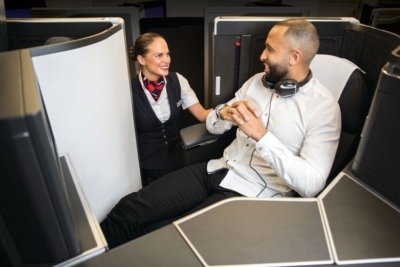 Not that BA restricting availability will affect much ex-Australia, but their flights to LHR from SIN/HKG are my go to route to the UK, so this would be a shame, especially with CX award space being virtually zero now, since their pricing blunder last year! Agree. Feeling slightly apprehensive about those routes also. Our main ones are KUL and HKG in F using our 241 vouchers. SIN rarely available, so don’t even bother looking. In fact looking now for next Feb and hardly an F seat to be seen. Someone mentioned it might be because of the current J and F luxury sale. Supply and demand determines cash pricing but hard to put prices up until all aircraft on a route have it. And if I have the choice of a 2am Dubai flight with this or 10am with old CW I will do the latter …! Hmm not impressed with the foot cubby – any ideas how cramped it’ll be? The Swiss ‘throne’ seat was atrocious, couldn’t lie on your side. Finnair slightly better but still felt cramped. What would you be happy with? I’d prefer no cubby at all, but if they’re going to have one at least make it spacious enough that you can turn over in the bed without your feet being unable to move. In fairness that’s what I like about the existing CW seat. This is nothing like the Swiss throne seat. Have flown it numerous times and its cubby is TINY and the seat itself is really short. The QR seat (also flown it numerous times) is much more spacious. The USB ports in the F seats on the 789 are hopeless. The cabin crew advise people to plug in via the main power outlet. I am happy to be a CW hater and been banned from redemptions. As this product will not be guaranteed on every flight and route for years I don’t have anything to be concerned about. 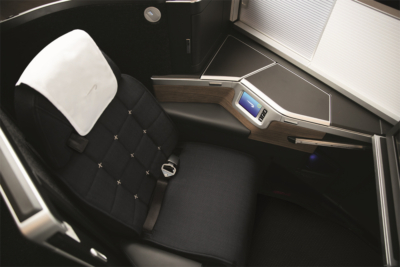 The much talked about AA seat is only on their B77W….. your point is? The seat on AAs A330s (ex US Air) is very similar to the seat on the 77W. The seat on the AA 787 is the B/E Aerospace Super Diamond. All of AA’s J seats are arguably better than the current CW, but its good to see BA slowly starting to catch up. Is the AA B77W seat better than the one on the A330, because I didn’t notice the difference. Yup, don’t want to hear folks in the suite next door ranting about how bad CW is and how great ME3 is. The problem with BA is that, no matter how comfortable the seat, it’s impossible to sleep because they whack up the temperature to 24C and there are no personal air vents. If you’re under a duvet, the maximum cabin temperature should be 18C (as I think Qantas concurred when doing research for their LHR-PER flights). Any chance the new BA suites will come with personal air vents? I’ve slept much better in far inferior seats when they have these. Am I the only one that finds BA CW cooler than the rest? Have I gone mad? Agree. 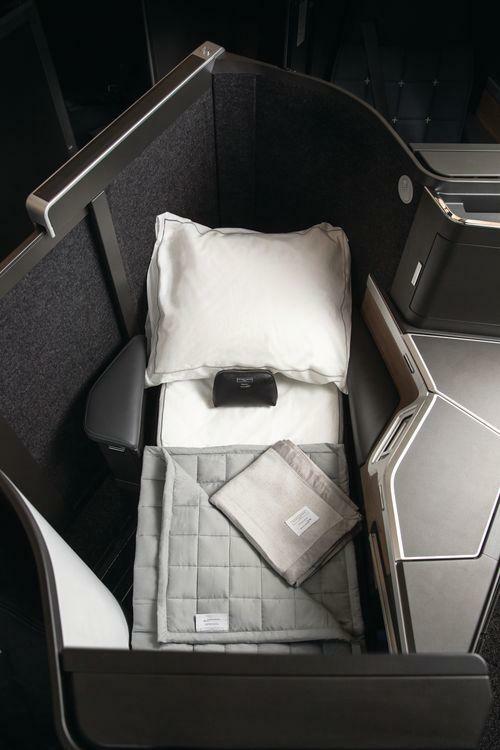 BA keep the cabin cooler than most airlines. This is fully in line with the tradition of keeping the room temperature in British houses just above the freezing point! I also have found BA mostly too hot. But the worse problem is the fluctuations. Just as you are dozing off under the duvet, the oven doors are flung open with a great waft of hot air for 2 hours such that you have to rip off the duvet and strip down to your boxers. Then you wake up shivering when it’s too cold again. Impossible to sleep through those temperature changes. I fail to see why anyone would even get semi excited. We can now use avios for business class awards on BA metal instead of using other oneworld carriers perhaps? I don’t fly BA CW if booking a single seat as I can’t step over other seats due to a dodgy knee, So big difference for me as I need direct aisle access. Even as gold I cant risk a late seat change. First up it look awfully like the AA seat but with a door, so its years behind the competition. Direct aisle access is the key and that is delivered. The rest of the service now needs to match starting with grumpy unprofessional crew who talk all night and stomp up and down the aisle like flatted footed oafs. Food then becomes important and IFE content. I am less concerned about alcohol as I find I drink less and less on board now. So, 10 out of 10 for effort, roll out of 4-5 years I think will be an issue. Just how long can they keep flogging the 747 on a route like JFK when these seats are flying to other places. This seems like a genuine improvement. For all the reasonable positivity to the staged introduction, how ‘easy’ it’ll be to redeem over time will be the key thing. As others have commented, a devaluation feels likely in time….. It won’t be a problem moving from F to J, with these beds in situ. But will,wait a few years tho. So assume F will be around for a while yet. But not on the A350?